The month of January held many games for the Central Collegiate Women’s Hockey Association teams. Throughout the month, many players shined bright, but three players stood out the most. 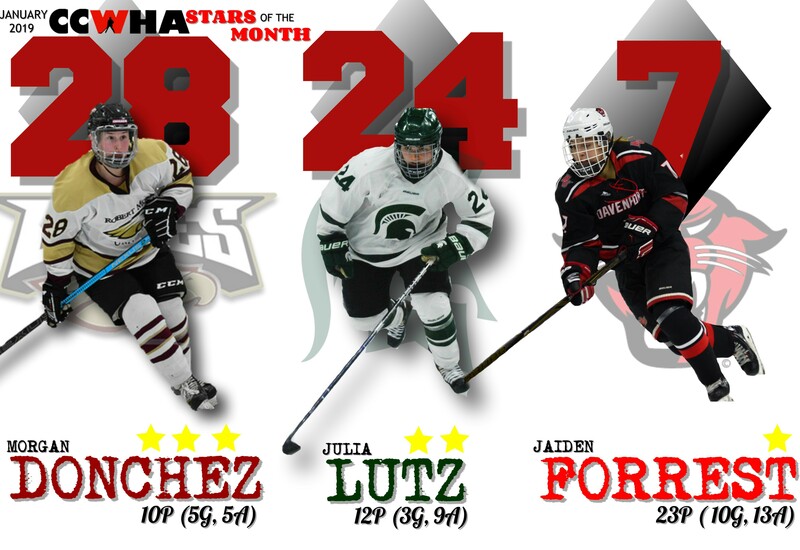 These three standout players, from various CCWHA teams, have been named the January 2019 CCWHA Three Stars of the Month. The league’s third star goes to Robert Morris University’s Morgan Donchez. The freshman put up ten points (5g, 5a) in the first month of 2019. In a series with the Grand Valley Lakers, Donchez found two goals, while the Eagles only had three goals during their two games. The second series of January had a non-CCWHA opponent, in the University of Wisconsin. In RMU’s 9-5 win over the Badgers, Donchez tallied three points (2g, 1a) before putting up five points (1g, 4a) in game two in a 6-1 win. With 31 total points (18g, 13a) this season, Donchez is the second leading point getter for the Eagles. 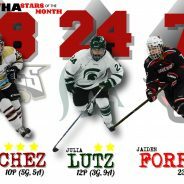 January’s second star of the month goes to Michigan State’s Julia Lutz. The junior forward tallied 12 points (3g, 9a) for the Spartans last month in five games. A three game weekend, gave Lutz a total of six points. In the loss to McKendree the forward would grab the only goal, in the 7-0 blowout three points (1g, 2a) were gathered, and against Lindenwood-Belleville the first year Spartan gathered two assists. The series against Michigan saw six more points from Lutz. Three assists in the 10-1 win and a single goal and two assists led Lutz to be second star of the month. Lutz has got 34 points (18g, 16a) this season, second on the team to help lead the Spartans. The January 2019 CCWHA first star of the month is awarded to Davenport University’s Jaiden Forrest. The Panther put up 23 points (10g, 13a) in seven games. In a huge 23-0 win over non-CCWHA member Concordia University, Forrest grabbed 10 points (2g, 8a). During the series with the Michigan Wolverines, the newly selected U.S. National Team member tallied the only goal in the two games. The Panthers faced cross-town rival Grand Valley next, with Forrest grabbing two goals in the 6-2 loss. With a sweep of Aquinas College, the junior forward put up eight points (4g, 4a) in the two wins. To finish out the month, Forrest would find a goal and an assist in the loss to Central Michigan. Leading the Panthers in points this season, Forrest has collected 37 total points (19g, 18a).